When we read Israel being de-legitimized and compared to fascist countries in the 1930s, it’s easy to wonder if Israel has any friends left. Yet, even during the Holocaust, there were some righteous Gentiles who gambled with their lives to speak out against this type of blatant anti-Semitism. One of them was a Dutch reformed pastor who was actively involved in hiding Jews, imprisoned several times during World War II. His son, Willem J.J. Glashouwer, followed in his footsteps after undergoing major brain surgery when he became a minister in Holland and then full-time President of Christians for Israel International in 1999. 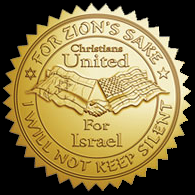 CUFI has a tremendous YouTube video highlighting its mission. It also focuses on colleges to develop politically-minded student leaders as “effective advocates for Israel on their college campuses,” and offers local events around the country, educating Christians about Israel. On January 26, CUFI offered a “Standing with Israel” event at the University of Detroit campus, featuring special guest speaker, Irving Roth, a Holocaust survivor and international educator, talking about his experiences and promoting a more accepting and diverse world. Last year, Hagee presented members of Congress with a petition signed by over 100,000 American Christians, expressing solidarity with the state of Israel. This does not stop many Jews from being skeptical or at least ambivalent about evangelical Christian support of Israel, nervous about prophecies of the “end of days.” Yet, it is abundantly clear to me and to many other Jews that Israel truly does have a large number of Christian friends who stand with Israel. If Jews feel lonely in a world pushing hard for a Palestinian nation in the tiny land of Israel or if we feel guilty when Israel does something “controversial,” we can take solace from thousands of Christians who demonstrate support and friendship for the nation of Israel. No matter how harsh the condemnations are from so many in the world, we do still have friends. And for that, we should be grateful.